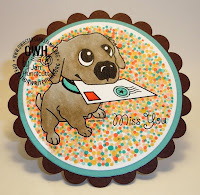 This week's featured cardmaker is Stars & Stamps' very own midweek throwdown coordinator, Jan. Be sure and visit her blog, She's Gone Stampin', to see more of her beautiful cards. How long have you been stamping? I've been stamping since 2004. I was a scrapbook enthusiast before that. Do you have a craft room or specific area where you stamp? Our kitchen is my craft room. We remodeled the kitchen a couple of years ago, at that time we added an extra wall of cabinets and a custom built table for my card making. There are also additional cabinets in the garage close by to store craft supplies that won't melt in the summer. What are your favorite stamp products? Ahhh... all of them! I'm using a lot of digital images any more, I really like the way I can make them any size I want to work with and being able to merge them together is fun too. Not to mention the physical storage space they don't need. The essentials for me would be the Cuttlebug machine and an unlimited supply of embossing folders, the Spellbinders Wizard and an endless supply of Nestabilities dies and then there's my Copic markers, must have! Do you have a favorite technique? Today it's coloring with Copic markers, tomorrow, who knows? Are there colors you love to include on your cards? 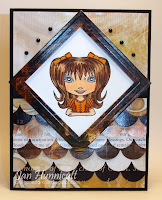 I think black and brown are great accent colors, Kraft is a color I've rediscovered and really enjoy using. I try to use a variety of colors in my projects mostly to challenge myself. How did you hear about Operation Write Home? I think I linked to the OWH main website first and discovered the OWH Stars & Stamps blog later. The challenges intrigued me and I thought it was a wonderful way to share my ever growing stash of cards and be a blessing to other people. Did I mention I love a good challenge?! Mostly the pleasure of card making, it's a wonderful creative outlet for me. The challenge to send a box of cards each month to Operation Write Home. My personal challenge is to send one package a month, I haven't given myself a number of cards to make, just the commitment to send one package a month. I also enjoy making cards for our heroes in memory of my Dad, he was a WWII veteran. 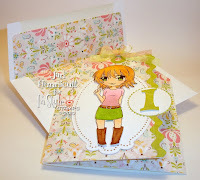 How did you become involved with the Stars & Stamps blog? I was asked by Sandy and Karen if I'd like to do the Midweek Throwdown challenges in May of 2010. I thought that sounded like a lot of fun so I accepted their offer. They both took me under their wings and showed me what to do, even if it meant making a late night phone call to them! I really appreciate how they both took such good care of me while I was learning how to make it all come together. What has being on the blog meant to you? Being part of the Operation Write Home team has been a blessing to me. It's a wonderful way for me to share my God given gifts and talents with other people. Jan, your cards are gorgeous and inspiring. I enjoy the mid-week throwdown and hope that once the yard work season is over, I'll be able to try it. I love the idea of a craft area in the kitchen! Thanks so much for sharing and I plan on making many visits to your blog in the future. 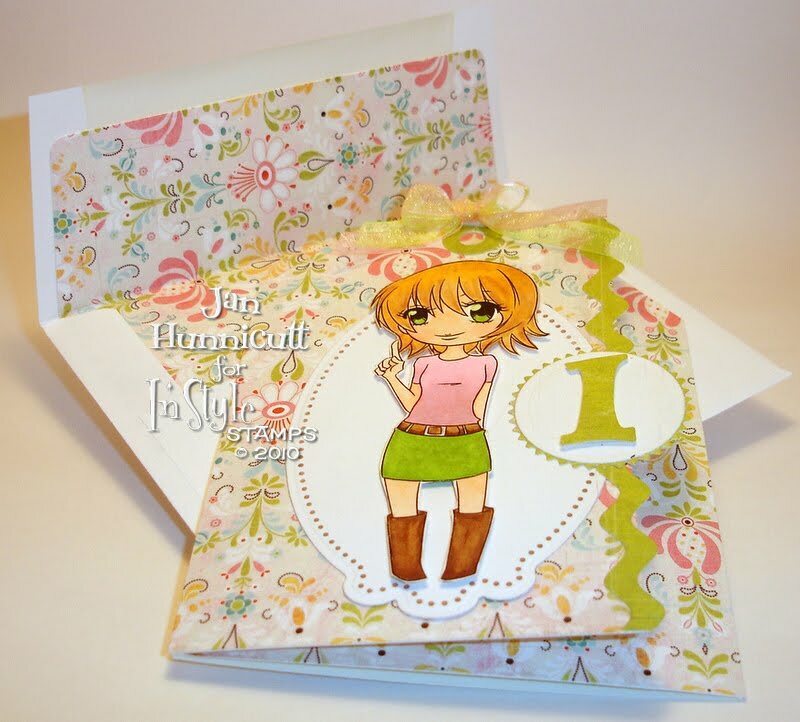 Jan all of your cards are so cute! 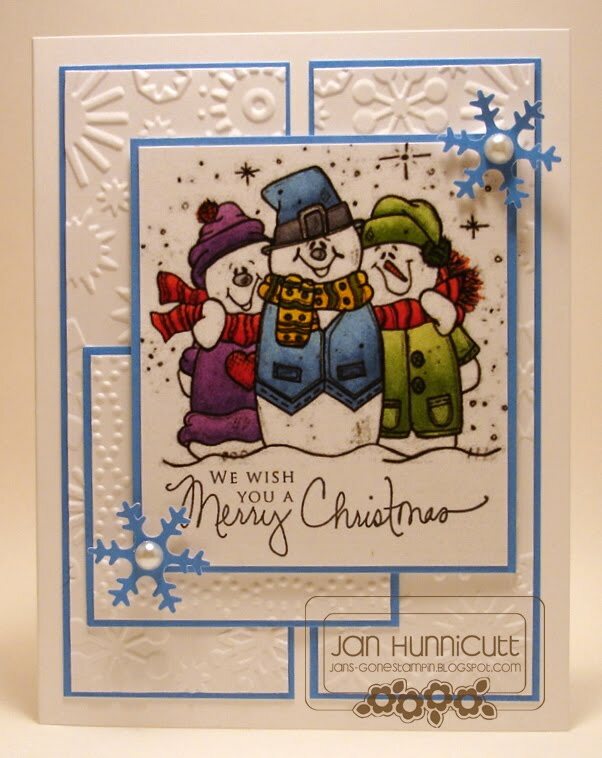 Jan you do beautiful work - love all your cards. And thanks for all your hard work on the Throwdown! Love all your work, Jan! I'd love to see some pictures of your craft area. It sounds fabulous! Although I've known you for a while through OWH, it's nice to learn a little more about you and see more of your gorgeous creations! Keep up the great work you busy busy lady!!! Jan, your cards are so beautiful. 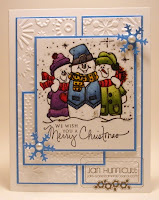 I just love the snowmen card, just wonderful. It was nice to get to know you a little bit better. Thanks for sharing. 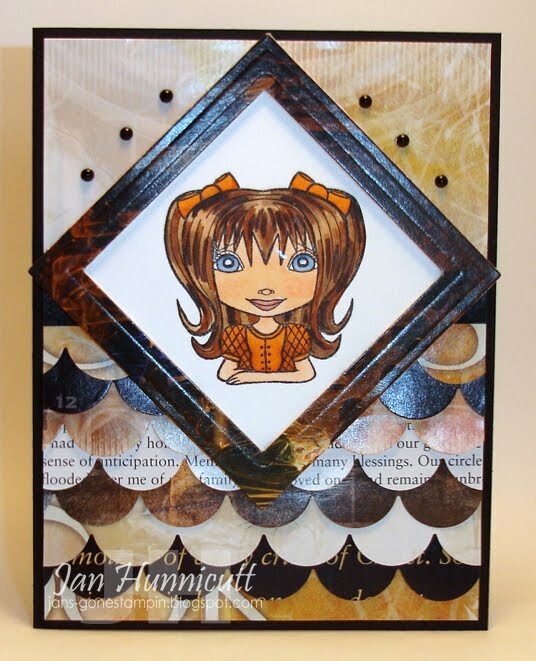 Yaay Jan - I am so happy to see that your are the featured card-maker and totally enjoy seeing all the wonderful cards you create. I also want to THANK YOU very much for inspiring me to join this wonderful group and do my little part in creating cards for OWH. I am truly honored and happy to help out! Thanks so everyone in this group, who does for much for our soldiers. You are all truly angels!! As always, your cards are wonderful. Thanks for sharing a little about yourself here...nice to know more about you. And thanks for the inspirations with those Midweek Throwdown challenges. I may not post them, but I do make them to mail to OWH. Be My Valentine BLOGHOP coming!